Clearly I love cinnamon buns. I make all sorts of variations, including sticky buns (link?) and pumpkin cinnamon buns (link?). 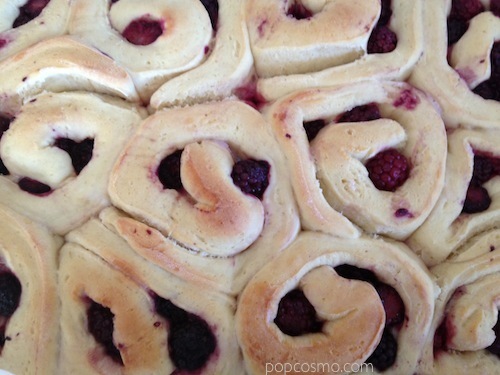 Here's another one that is perfect for Valentine's Day: Blackberry Buns. The tart purple berries pair well with the buttery bread, and they make a sweet, sticky syrup when they bake. I happened to have a ton of blackberries, but raspberries or even blueberries would work just as well. Raspberries or blackberries would be the best for Valentine's Day in terms of color, but use what you like and what you have. To add even more flavor, you can make a glaze. Just mix some powdered sugar with a spoonful of milk and whatever flavoring you want until you have a pourable glaze. I like to use vanilla extract or the zest from lemons or oranges, depending on which berries I use and what I'm in the mood for. Whatever you choose, this is definitely a fantastic Valentine's Day treat. In the bowl of a stand mixer fitted with a paddle attachment, whisk eggs to combine. Add buttermilk. Whisk in 1/4 cup sugar, 1 tsp salt, and yeast. Add two cups of flour and 6 T melted butter. Beat until just combined, then add in remaining flour. Knead with dough hook for five minutes. Knead by hand for one minute. Transfer the dough to a large, greased bowl. Cover tightly with plastic wrap and let rise in a warm, draft-free area for 2-3 hours. Toss the blackberries with the remaining sugar and cornstarch. Roll the dough out to a 12"x16" rectangle. Sprinkle with the berries, pressing lightly to adhere. Roll into a log, brushing the end with the remaining butter to seal. Cut into 12 buns. Place the buns into a greased 9"x13" pan. Wrap tightly with plastic wrap and let rise in a warm, draft-free area for 2-3 hours. Heat oven to 350F. Bake the buns for 20 minutes or until lightly browned.